Well equipped centre pivot window version with hinges positioned in the middle of the window height. Wooden window with increased resistance to moisture, with three coats of polyurethane varnish - creates a durable and perfectly smooth white layer. Designed for rooms with periodically increased humidity levels (kitchens, bathrooms). In laundries, drying rooms or bathing salons with high humidity levels maintained for a longer period, we recommend the use of aluminum-plastic windows. 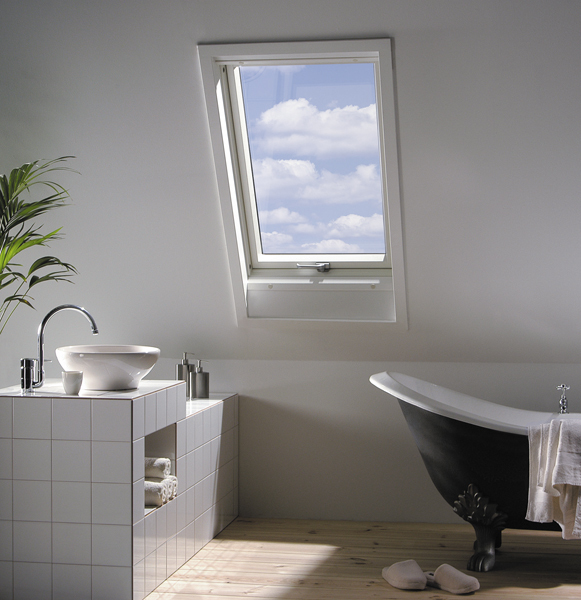 V40P automatic air-inlet provides an optimum amount of air into the room, ensures a healthy microclimate in the attic and saves energy. Easy cleaning of outer pane and easy awning blind installation-thanks to the bolt blocking the shash when rotated through 180 degrees.